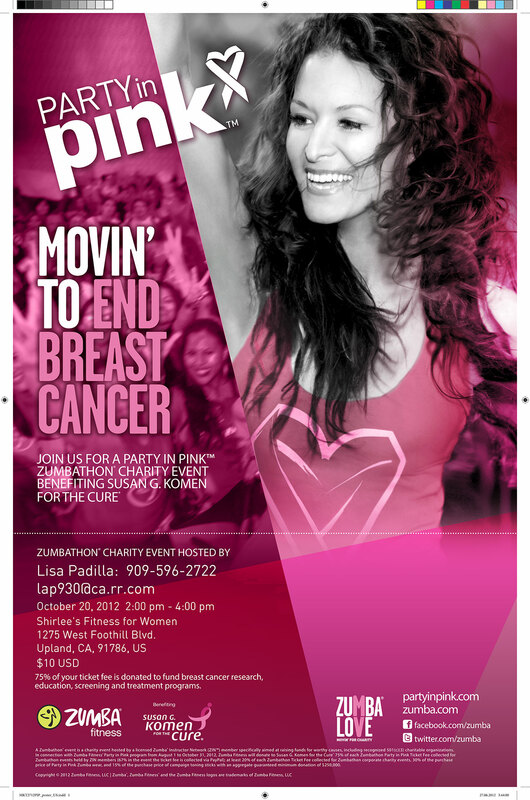 Come and join six GREAT instructors—Lisa Padilla, Cheryl Helgren Gomez, Annie Francese-McCutcheon, Sue Mayer, Cindy Gavin, and Martha Keates—for a two-hour Zumbathon to raise money for Breast Cancer Awareness. To spice things up even more, we will be raffling off valuable prizes. This outdoor event is open to both members and non-members, so please invite guests (even men) to attend. Mark your calendars for Sat, Oct 20, from 2-4 pm. We will be having raffles, refreshments and LOTS OF ZUMBA!! $10 tickets available at Shirlee’s and at the door! DONT FORGET TO WEAR PINK! This entry was posted in General, ShirleeStrong, Special Events and tagged cancer, zumba. Bookmark the permalink.